Deep frying is a popular and economically important method of preparing foods including peanuts. It is defined as the process for cooking foods by immersing them in edible oil or fat that has been heated to a temperature above that of the boiling point of water. Oil temperatures used are typically between 150°C and 200°C. The flavor, appearance and texture changes that occur in the cooked foods are very popular and the technique is valued for the speed of cooking. When used with peanuts or other tree nuts, the operation is usually referred to as oil roasting. In the current literature, the mechanism of deep frying is explained almost exclusively for high moisture foods such as potatoes and breaded meats[2,3]. With these high starch materials, the formation of a porous crust, oil uptake and color change would be the most distinctive features. In these cases, the changes are due to modifications in the starches present such as gelatinization, protein denaturation, oil migration into the microstructure of the surface, and heat induced interactions between the sugars and proteins present. For peanuts, the starch levels are relatively low, usually about 6 %, whereas the protein content is about 21 % and the fat levels can be as much as 50 %. Therefore, other features such as oil holding capacity surface changes and textures maybe affected in the finished product. Peanuts are dried or cured after harvesting in the field and then heated to reduce the moisture below 10 % for storage in order to prevent mold growth. Once shelled, the moisture level of raw peanuts is kept between 6 to 9 %. At this moisture range, they are normally processed by dry or oil roasting. Variations have been reported in the quality of the finished products after oil roasting as defined by surface appearance. Excessively oily appearance or dry surfaces that do not allow for the adherence of added seasonings are considered to reflect low quality product. The present study was designed to examine changes in the microstructure of peanuts as a result of the oil roasting process at two different moisture levels, with the goal to determine if initial moisture played a role in the appearance of the roasted product. In actual commercial practice, raw peanuts for further processing are stored at higher moisture levels than used in this study. It was necessary to remove the seed coats by blanching using a mild heat treatment prior to the oil roasting for the experiments. Therefore, the highest level of moisture that could be maintain for the samples was limited. However, from the results presented using the range of moistures produced, some conclusions may be made about the different surface characteristics of the peanuts after oil roasting. Virginia type peanuts (Arachis hypogaea L. cv. VA 98R) were harvested from the North Carolina State University Research Station, Rocky Mount, North Carolina, USA. The seed pods were field dried on the vines for three days to a level of about 18 %. The pods were harvested, bagged and dried with forced heated air in peanut drying wagons to a level of about 12 %. Two hundred pounds of pods were then brought to the Market Quality and Research Unit laboratory and dried on metal screens over forced air from mechanical blowers to levels of 7 to 10 %, then shelled and blanched. The final moisture values of the raw seed before roasting were determined using a forced air oven at 130°C for 6 h (AOCS Ab2-49). The water activity (aw) was measured for the samples before and after roasting was determined using an AquaLab meter (Decagon Devices, Pullman, WA). The raw, blanched peanuts were roasted in an HPE Model 500 deep fat fryer (Henny Penny Corp., Eaton, Ohio) using peanut oil at 160°C over a range of 2 to 4 min to a achieve a final L value of 48 ± 1 using a Hunter colorimeter (Hunter Laboratories, Reston VA). Three batches of 500 g of peanuts were roasted from each initial moisture level prepared. The moisture values were determined again for the roasted seed. All analyses were done in triplicate. Representative samples were randomly chosen and fixed for scanning electron microscopy (SEM) according to a published procedure. In brief, individual peanut cotyledons were briefly washed with distilled water to remove surface debris, patted dry, and cut in cross-section with a razor blade into 1-2 mm thick slices. Slices were trimmed to provide outer surface blocks that were 2-3 mm across. Samples were fixed in a solution of 3 mL/100 mL glutaraldehyde in 0.05 mol/L potassium phosphate buffer (pH 7.0, 4°C). Samples were then washed in three 30 min changes of cold buffer followed by dehydration with 1 h changes of a graded series of ethanol (30, 50 and 70 mL/100mL) at 4°C. Final dehydration intervals were 24 h each of cold 95 and 100 mL/100 mL ethanol, which was then allowed to warm to room temperature and followed with three 24 h changes of fresh room temperature ethanol. Samples were critical point dried in liquid CO2 (Tousimis-Samdri-795, Tousimis Research, Rockville, MD). The dehydrated tissue was mounted to aluminum specimen stubs using silver conducting paint. After drying overnight in a desiccator, the stubs were coated with 5 nm of gold-palladium alloy with a Hummer 6.2 sputter system (Anatech USA, Union City, CA) fitted with a Maxtek Thickness Monitor Model TM-100 (Maxtek, Inc., Santa Fe Springs, CA). Specimens were viewed with a JEOL JSM-5900LV Scanning Electron Microscope (JEOL U.S.A., Peabody, MA) at a working distance of 15mm with an accelerating voltage of 15 kV. A single peanut seed consists of two main sections called cotyledons. Each cotyledon has a flat inner surface and an outer surface whose roundness defines the peanut shape. During roasting, the outer surface is completely exposed to the hot oil which serves as the heating matrix. Since the two cotyledons are not sealed, roasting oil is able to contact the inner surface as well. Peanut seed will split apart due to mechanical handling, so a single batch will contain both intact seed and single cotyledons referred to as splits. For this work, both intact and split seeds were included in the batches, rather than being sorted to remove the splits. Moisture was found to have a role in the amount of time needed to achieve the final roast color of 48 L (± 1) on the Hunter scale for the outer surface of the peanuts. At the lowest moisture (4.24 ± 0.13 %), roast time required was 3.50 min and at highest moisture (6.62 ± 0.10 %), 2.25 min were needed. It could be reasoned that shorter browning times of the higher moisture samples were due to water available for Maillard browning. It has been reported that the extent of non-enzymatic browning increases with water activity until a level of about 0.8 and then sharply decreases. The water activity (aw) of the raw high moisture sample for this study was found to be 0.73 and that of the low moisture was 0.41. This higher value would indicate a higher thermodynamic availability which is necessary for the nonenzymatic browning indicative of roasting. This phenomenon has been reported for microwave heating as well by Peterson and co-workers. The microstructure of raw peanuts has been reviewed. The exterior surface can contain areas of damage due to mishandling or poor growth conditions such as drought. These areas will appear as irregular shallow patches. The epidermal cells on the outer surface appear as raised ridges with rectangular outlines. Once the peanut is cooked, the surface was disturbed due to ruptures from the steam escaping. Figure 1: Scanning electron micrograph of the outer surface of a low moisture peanut cotyledon after oil roasting. Arrows indicate the pock marks formed in the surface by the escape of steam. Note the rectangular outline of the epidermal cells. Figure 1 shows this outer surface for the sample with the low moisture (4.24 %) after roasting. The ruptures appeared as random pock marks over the surface as indicated by the black arrows. These were differentiated from surface damage that might be due to other conditions in that the edges of the ruptures were pushed upward from the surface as indicated by the white shadows or halos around the holes. 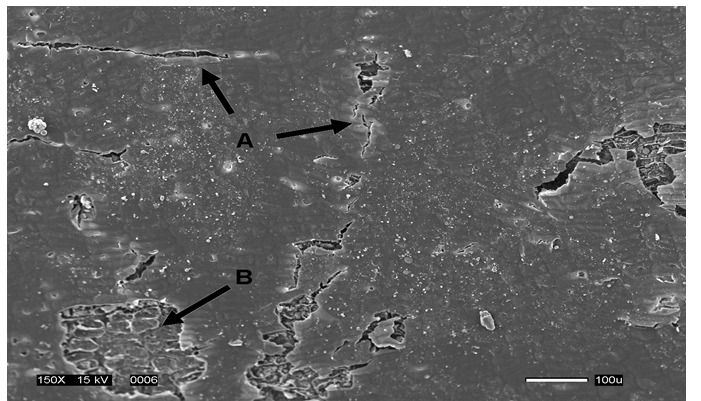 When the higher moisture sample (6.62 %) was roasted, the surface was interrupted by a series of eruptions that appeared as elongated tears as seen in Figure 2. Figure 2: Scanning electron micrograph of the outer surface of a high moisture peanut cotyledon after oil roasting. Arrow indicates the continuous surface tear formed by the escape of steam. This could be logically explained by the need for higher amounts of steam to escape with the increase in temperature. Another view of the surface of the higher moisture sample is presented as Figure 3. It shows that the tears (A) were randomly oriented and did not follow the pattern of the epidermal cells, which appear as rows of elongated rectangles. The large patch labeled B is indicative of the surface damage due to handling before roasting. Figure 3: Scanning electron micrograph of the outer surface of a high moisture peanut cotyledon after oil roasting. A labels the continuous tears that are not necessarily parallel to the epidermal cells. B labels the surface damage due to pre roast handling. From the micrographs of the interiors, it is possible to study the changes that occurred within the cells both with the initial drying and with the oil roasting. Figure 4 shows the high moisture sample in the raw state. This level of moisture of 6.62 % was characterized by the dense cytoplasm network covering the cell interiors (C). This was compared to the low moisture sample (4.24 %) before roasting (Figure 5), where the network was more sparse (B). It has been determined that the small spherical bodies of 1 to 3 μ contained within the cell walls are the lipid bodies. The large spheres of 5 to 8 μ are proteins and starch granules which cannot be distinguished from each other with SEM. In addition to this, the outer surface epidermal cells (A) in Figure 5 for the 4.24 % moisture sample appeared to be larger and emptier than those of the higher moisture (6.62 %) sample (B) (Figure 4). Although it has been seen that there is a reduction in cytoplasm material and an increase in the size of parenchyma cells with maturity[11,12], the seeds in this study were all of the same maturity to eliminate that variability. In Figure 4, the higher moisture sample (6.62 %) also still had testa attached despite the rigors of preparing the sample for imaging (A). 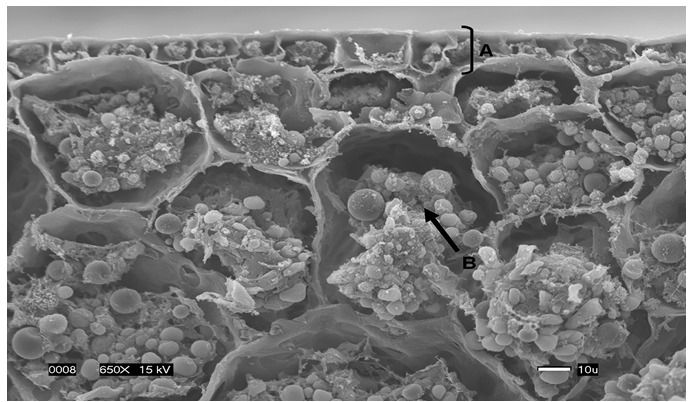 Figure 4: Scanning electron micrograph of a cross section of the outer surface of a high moisture raw peanut cotyledon. A labels the area where the testa is still attached despite fixation treatment. B labels the compacted epidermal cells at the surface. 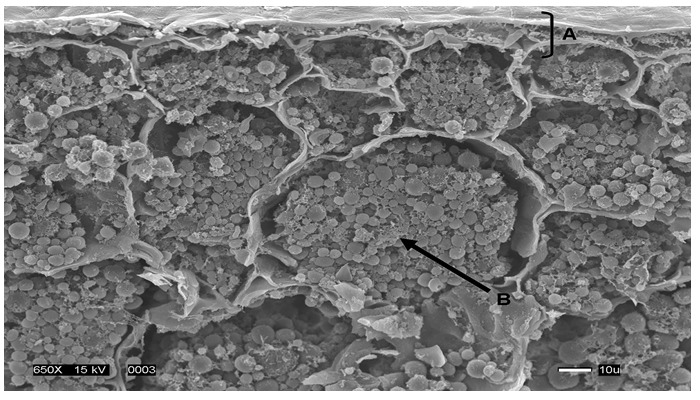 The dense intact cytoplasmic network across the parenchymal cells of the mid region are labelled as C.
Figure 5: Scanning electron micrograph of a cross section of the outer surface of a low moisture raw peanut cotyledon. The wider, less filled epidermal cells at the surface are labelled as A. B labels out the parenchymal cells of the mid region that is nearly devoid of any cytoplasmic network. After the roasting, the moisture contents were found to be 1.19 ± 0.08 % for the lower moisture sample and 1.65 ± 0.23 % for the higher moisture sample, respectively. At this point, both samples showed loss of the cytoplasm network (Figures 6 and 7). This was more pronounced in the sample that was initially higher in moisture (6.62 %) than the sample with the lower initial moisture content (4.24 %). However, the lower moisture (Figure 6) showed greater losses of sub cellular organization, which was attributed to the longer heating time resulting in more internal damage. Also, both samples showed breakdown of the parenchyma cell walls. Once this occurs, lipid bodies are free to move out of and between the cells. The lower moisture sample (Figure 6) showed the cellular contents packed together away from the walls after roasting. The material was beginning to lose the distinct shapes of the various components, but not to the extremes as seen in the micrographs in a previously published work which used a longer cooking time of 10 minutes. The rounded bodies of starch, lipid and protein were becoming less spherical, more flattened and closely packed in the present study. 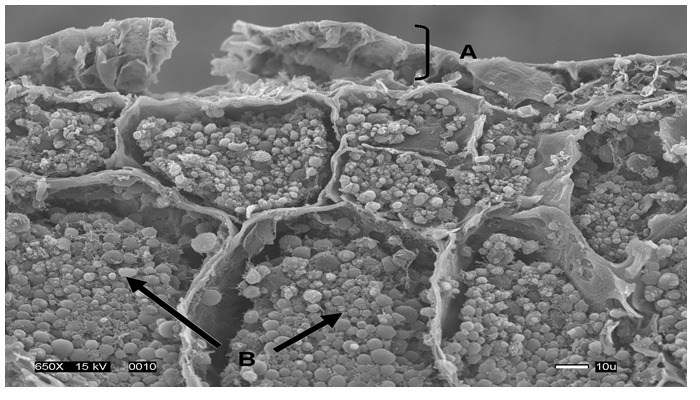 Figure 6: Scanning electron micrograph of a cross section of the outer surface of a low moisture peanut cotyledon after oil roasting. 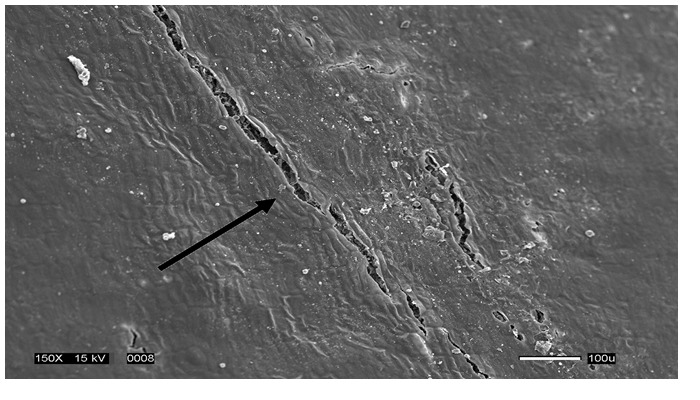 The compacted epidermal cells at the surface are labelled as A. The distortion of the interior subcellular organization is labelled as B. 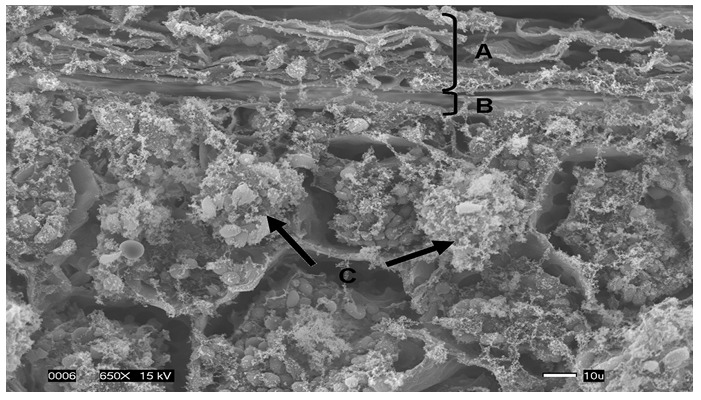 Figure 7: Scanning electron micrograph of a cross section of the outer surface of a high moisture peanut cotyledon after oil roasting. The rupture of the epidermal cells is labelled as A. The relatively intact subcellular organization is labelled as B. Note loss of the cytoplasmic network. At the higher initial moisture (6.62 %) level (Figure 7), this was less apparent than in the lower initial moisture sample (4.24 %), as the cooking time was shorter at only 2.5 minutes compared to 4 minutes. The internal cell contents were more spherical after cooking and did not appear to be moving away from the cell walls. This was attributed to the shorter heating time. The exterior color was achieved faster, so that the peanuts were removed from the hot oil sooner, causing less damage to the interior of the seed. 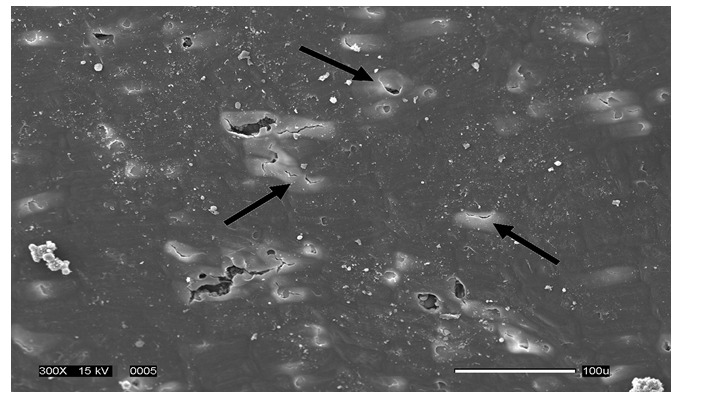 The epidermal layer cells labelled A in Figure 7 appeared to be empty of cell contents compared to the lower moisture sample (A) in Figure 6. This indicated that the cell changes were increased due to the need for more water to move out of the sample with heating. Observations discussed in this report indicate that moisture content of raw peanuts before oil roasting plays a major role in the quality of the finished roasted product. Higher moisture seed took less time to reach desired outer color, but there was more damage to the exterior of the product. Examination of the micrographs of the surfaces and the interiors of peanuts before and after oil roasting in this study showed that the lower moisture (4.24 %) before the roasting had more interior damage. As available water is known to play a role in the non-enzymatic browning reaction, it would be advantageous to use seed that is not too dry for the production of oil roasted peanuts from the perspective of color development with retention of interior structures. This study proposed that it would be possible to produce a finished product of the desired color with less heating time and less internal damage. Knowledge of the effects of such differences in composition in raw peanuts is important to produce quality oil roasted peanuts consistently. We are grateful to Mr. James Schaefer, Mr. Michael Sanders and Ms. Jennifer Stephenson for assistance in processing of the raw seed and in the roasting and to Ms. Valerie Knowlton of the North Carolina State University Center for Electron Microscopy for assistance with the microscopy. The use of trade names does not imply endorsement by the USDA, ARS of the products names nor criticism of similar ones not mentioned. 1. Farkas, B.E., Singh, R.P., Rumsey T.R. Modeling heat and mass transfer in immersion frying. I, model development. (1996) J Food Eng 29(2): 211-226. 2. Orthoefer, F.T., Gurkin, S., Liu, K. Dynamics of frying. In E. G. Perkins and M. D. Erickson (eds). Deep Frying: Chemistry, Nutrition, and Practical Applications. (1996) AOCS Press: Champaign ILpp: 223-244. 3. Farinu, A., Baik, O.D. Deep fat frying of foods-transport phenomena. (2005) Food Rev Inter 21(4): 389-410. 4. U.S. D.A. Agricultural Research Service. USDA National Nutrient Database for Standard Reference, Release 21. (2008) Nutrient Data Laboratory Home Page. 5. Davidson, J.I., Whitaker, T.B., Dickens, J.W. Grading, cleaning, storage, shelling, and marketing of peanuts in the United States, In H. E. Pattee & C. T. Young (eds.) Peanut Science and Technology. (1982) American Peanut Research and Education Society, Inc., Yoakum, TX: pp. 571-623. 6. Cea, T. Planters Division (2009) Kraft Foods Inc., private communication. 7. Young, C.T., Schadel, W.E. Microstructure of peanut (Arachis hypogaea L. cv. Florigiant) cotyledons after oil cooking. (1991) J Food Sci 56(1): 76-79. 8. Labuza, T.P., Baisier, W.M. The kinetics of nonenzymatic browning. In H. G. Schwartzberg and R. W. Hartel (eds.) Physical Chemistry of Foods. ( 1992) Marcel Dekker, Inc., New York: pp.595-649. 9. Peterson, B.I., Tong, C.H., Tong, C.T, et al. Effect of moisture content on maillard browning kinetics of a model system during microwave heating. (1994) J Agric Food Chem 43: 1884-1887. 10. Young, C.T., Schadel, W.E. Microstructure of peanut seed: a review. (1990) Food Struc 9: 317-328. 11. Young, C.T., Pattee, H.E., Schadel, W.E., et al. Microstructure of peanut (Arachis hypogaea L. cv. 'NC 7') cotyledons during development. (2004) Lebens Wiss Techn 37: 439-445. 12. AOCS. Official Methods and Recommended Practices of the AOCS. 5th ed., D. Firestone, editor (2003) Champaign, IL: American Oil Chemists' Society.